Have you always wanted to transform your kitchen into your dream space? If so, make sure you read our newest guide before you get started. 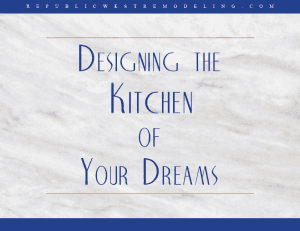 Republic West Remodeling has developed an informative guide that outlines the steps you need to take to get your perfect kitchen. We give you tips on how to make the most of your space. And we explain how you can breathe life into your kitchen design without falling victim to the latest fads. With a potentially high return on investment, you want to make sure your kitchen design doesn’t get off track. Our new guide talks about all the design elements you need to consider in your project so you get exactly what you want. Later this month, we’ll tell you how to get this informative resource. So, check our blog regularly for the upcoming announcement.